Used 2002 Trilectron 90T400SLN Aircraft Ground Power Unit (GPU). 90 KVA with 13,503 recorded hours of service. The aircraft gpu will be fully serviced, load bank tested, and freshly painted prior to shipment. Used 1997 Trilectron 90T400SLN Aircraft Ground Power Unit (GPU). 90 KVA with 9,975 recorded hours of service. 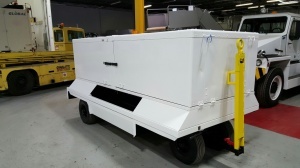 The aircraft gpu will be fully serviced, load bank tested, and freshly painted prior to shipment.